Epson has launched its new FastFoto FF-680W High-Speed Photo and Document Scanning System, a model it claims is the fastest personal photo scanner currently available. At max speed, the FastFoto FF-680W can scan a photo every second at 300dpi (up to 36 photos per batch). The FF-680W, which builds upon the existing FF-640 model, supports a variety of media types, including Polaroids, postcards, and panoramic photos, as well as scanning in 300dpi ("easy sharing"), 600dpi TIFF ("archiving"), and 1200dpi ("enlarging") modes. More than one mode can be used per photo batch. The scanner also supports document scanning with OCR. Both USB and wireless connectivity is supported. 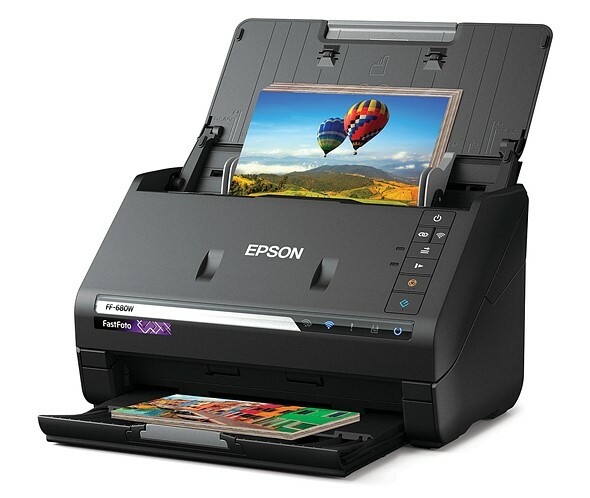 Users can directly share scanned images to Google Drive and Dropbox, capture handwritten notes on the back of an image during a single scan, and perform modest photo restoration and edits using Epson's ScanSmart software. The Epson FastFoto FF-680W scanner is available through the company's website and at select retailers, including Amazon, for $599. 99 USD.